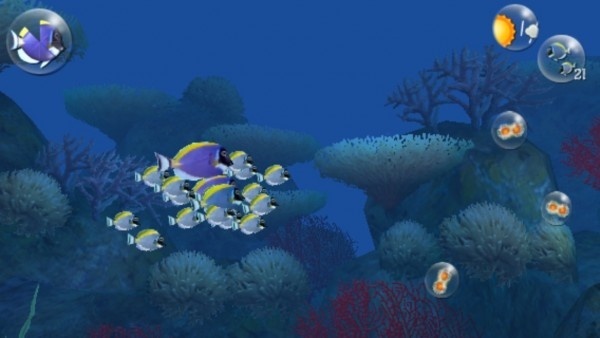 Experience the life cycle of a surgeonfish in this somewhat educational game. On an App Store full of fast-paced action and frivolity, Blue Eden is quite the change of pace. 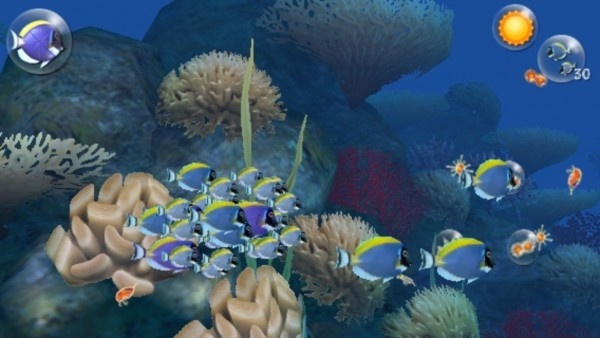 Tackling the important issue of the beauty of the underwater world and how the Surgeonfish's life cycle proceeds, it's a game that feels quite educational. While it's perhaps not as gripping as other titles, it's certainly an interesting departure from the norm. Divided into four different types of game, Blue Eden starts out with a fairly lengthy tutorial. Introducing the different elements takes time and, admittedly, these could be more grippingly told. The four different elements are comprised of key components to life such as survival, breeding, feeding, and migration. Migration involves simply exploring the scenery, tapping on reeds that one thinks other fish might be hiding behind. Feeding forms a type of Match-3 game in which one must match up corresponding icons to feed the fish faster and before the time runs out. Breeding requires one to flick fish upwards to clash with others, thereby causing eggs to be fertilized. Survival is the most involved process with players drawing lines to dodge the attack pattern of predators. In each case, there are timers involved restricting how long each stage takes. Each stage has varying levels of success too, in terms of entertainment value. Migration is briefly fun but often outstays its welcome, while breeding is often a little awkward and unexciting. The survival side of things is the most satisfying with feeding similarly entertaining if simplistic. The key throughout all of this is the educational message that Blue Eden brings with it. It's also like precious little already out there, which should certainly be applauded. It might not always hit the spot, but for a fairly original experience it's worth taking a look at.